OUR NEW OFFICE IS FINALLY OPENED!!!!!!! Our Office is located at 320 Old Country Rd., Suite 101. The office can be directly accessed from the parking lot in the back of the building. We are located on the first floor. 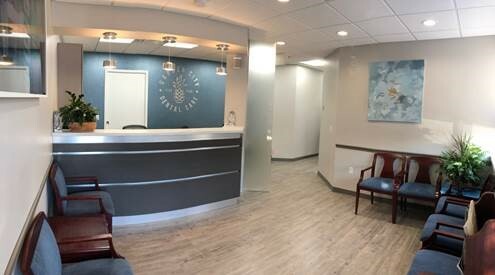 You will enter directly into our dental suite at the black "Garden City Dental Care" awning. We are on the South side of Old Country Rd between Washington Ave. (Roslyn Rd.) and Lefferts Rd. We are one block east of the Nassau County Courts. Our Suite consists of FIVE treatment rooms, Central sterilization, laboratory, private office, reception, and a rest room. Our treatment rooms are all newly equipped with the highest quality ADEC dental units. Our digital x-ray system greatly reduces radiation exposure and allows immediate viewing on the computer monitor at each chair. The sterilization of our instruments and treatment rooms is of the highest standard of care. Ultrasonic cleansing, and steam autoclaving is done routinely on all instruments and handpieces (drills). We have implemented the IMS system of packaging, storing, and sterilizations of our instruments. A full service on-site dental laboratory allows the doctors the flexibility, and opportunity to meet the prosthetic needs of their patients.